You need to create a reusable component. But the children prop won’t cut it. This component needs to be able to accept multiple children and place them in the layout as it sees fit – not right next to each other. Maybe you’re creating a Layout with a header, a sidebar, and a content area. Maybe you’re writing a NavBar with a left side and a right side that need to be dynamic. These cases are all easy to accomplish with the “slots” pattern – a.k.a. passing JSX into a prop. TL;DR: You can pass JSX into any prop, not only the one named children, and not only by nesting JSX inside a component’s tag – and it can simplify data passing and make components more reusable. So that we’re all on the same page: React allows you to pass children to a component by nesting them inside its JSX tag. These elements (zero, one, or more) are made available inside that component as a prop called children. React’s children prop is similar to Angular’s transclusion or Vue’s <slot>s. (This, by the way, assumes that the Icon component rendered out the <i> tag there). So not only can you pass children as a regular prop, but you can pass JSX into a prop? WHAT. What if I told you, you can pass JSX into any prop? You could imagine that Layout could be much more complex internally, with lots of nested divs or Bootstrap classes for styling or whatever. Or it could pass the sections down to specialized components. Whatever Layout needs to do, its user only needs to worry about passing in those 3 props left, top, and center. Another nice thing about passing children as a prop (whether that’s children proper, or some other prop) is this: at the point where you pass in the child prop, you’re in the parent’s scope, so you can pass down whatever you need. It’s like skipping a level. For instance: instead of having to pass, say, a “user” to a Layout and have the Layout pass the “user” to the NavBar, you can create a NavBar (with the user already set) and pass the whole thing into Layout. This can help avoid the “prop drilling” problem where you’ve gotta thread a prop down through multiple layers. Not as nice, right? Threading props down this way (aka “prop drilling”) couples the components together more than you might want – not always a bad thing, but good to be conscious of. Using children as in the previous example can avoid having to reach for more complex solutions like context, Redux, or MobX (to name just a few). If you need to implement shouldComponentUpdate (or PureComponent) on a component that takes children, and it prevents a re-render, that’ll prevent the children from rendering, too. So, just keep that in mind. 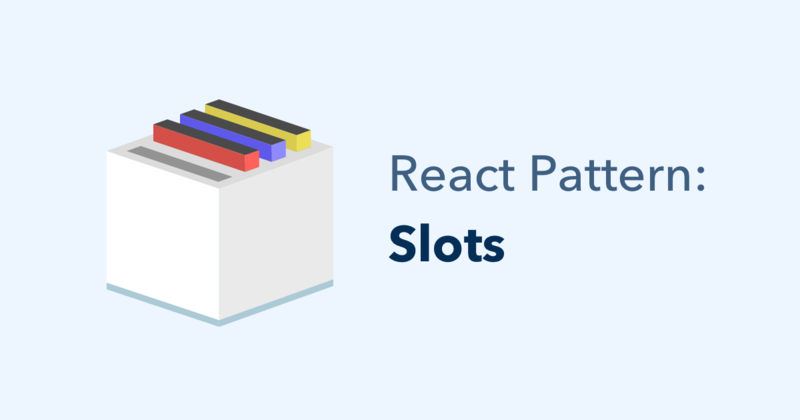 In practice, components that have “slots” are probably pretty likely to be minimal and quick to render, anyway, and therefore less likely to need performance optimizations. If you run into a situation where you do need to optimize performance of a “slotted” component, consider extracting the slow-performing part into a separate component, and optimizing it independently.